AP ECONOMICS: SUPPLY AND DEMAND WORK SCHEDULE ASSIGNMENT FOR DAY 1: Warning, this will take a while  1. Read “The Importance of Prices in Resource Allocation” 2. Read “Cetaris Paribus” 3. 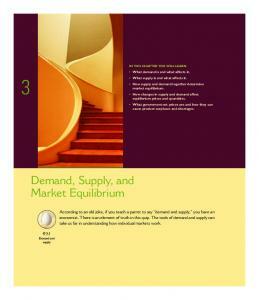 Read “Demand, Prices, and Markets” and complete questions. DAY 3: Review answers to demand determinants practice questions. Construct a demand curve when given data. Analyze the graphical relationship between price and quantity demanded for a market. Analyze the effect of a change in demand on a demand curve and the change in price and quantity that result from the change. ASSIGNMENT: 1. Draw a demand graph for each of the examples on the Demand Determinants Practice sheet that illustrates the changes that need to be made. 2. Read "The Basics of Supply" and complete the 2 exit questions. DAY 4: Analyze the difference between a change in supply and a change in quantity supplied. Analyze the Law of Increasing Costs and the Law of Supply Identify the determinants of supply and provide an example for each. Analyze the effect of a change in supply on price and quantity for a market. ASSIGNMENT: 1. Complete "Supply Practice Scenarios" worksheet for Day 5 2. 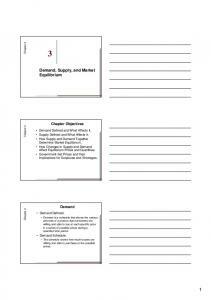 Read "Graphics of Supply"
DAY 5: Review answers to supply practice scenarios. Construct a supply curve when given data. Analyze the graphical relationship between price and quantity supplied for a market. Analyze the effect of a change in supply on price and quantity of a good in a market. ASSIGNMENT: 1. 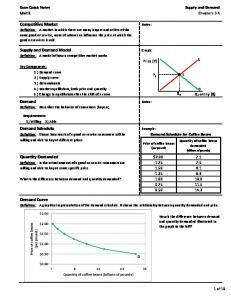 Draw a supply graph for each of the "Supply Practice Scenarios" sheet that illustrates the changes needed. 2. 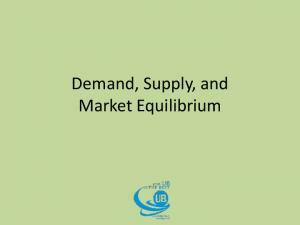 Read "Equilibrium: When Supply and Demand Fall in Love" in manual. DAY 6: Analyze the conditions present at equilibrium and the effect of equilibrium on prices in a market. Given data, determine equilibrium in a given market. Illustrate the effects of a change in either demand or supply on equilibrium price and quantity. ASSIGNMENT: Complete "Supply or Demand You Decide"
DAY 7: Review answers to "Supply or Demand" Complete another set of practice scenarios and review answers. ASSIGNMENT: Read "Price Ceilings and Floors" in manual. DAY 10: SUPPLY AND DEMAND EXAMINATION! TEXT BOOK INFORMATION FOR THIS UNIT Chapter 3 in your text is dedicated to the study of market price determination through supply and demand. It will add valuable insight into the workings of price mechanisms, especially for those of you that may need more in depth reading that you were given in the packet readings. Of special interest within the chapter are the following items: At the bottom of page 47 there is a great explanation of how demand for three different people converge to create a single demand curve. This is definitely worth looking at. In the yellow box on page 49 there are good examples of the determinants of demand. On page 53 there are good examples of the determinants of supply in the yellow box. A good story on ticket scalping and how scalpers help markets to work better. On page 55, read “Rationing function of prices” as well as “Efficient Allocation” Good info in the Salsa and Coffee beans box on page 58 In the “Last Word” box on pages 60-61 there is a thought provoking story on organ transplants. Note that the DECREASE in DEMAND both the price and quantity of chocolate to decrease DUE to the change in the price of peanut butter. This is a properly labeled graph showing the correct effect in this market under these conditions with this single change all else remaining equal. This is what your completed practice questions should look like when finished. AP DEMAND DETERMINANTS PRACTICE SHEET For each of the following statements you must do the following: A. Indicate the determinant of demand that is being changed B. Tell what will happen to demand for the item in the statement C. Tell what will happen to price and quantity demanded for the item 1. If the price of bottled water is increases, what will happen in the market for carbonated beverages? The effect of an increase in the price of gasoline on the market for brakes on cars. The effect of an increase in the price of train tickets on the market for air travel. The effect of a decrease in income taxes on the market for televisions. The effect on a desire for more economic freedom on the market for ATM fees. The effect of an announcement by the Surgeon General on the negative effects of sun exposure, on the market for sun block. The effect of an increase in the price of newspapers on the market for advertising in the newspaper. The effect of a recent winning streak by the Steelers in December on the market for hot chocolate at Heinz field. The effect of a decrease in internet access fees on the market for personal computers. AP ECONOMICS SUPPLY PRACTICE SCENARIOS Do the following for each statement: A. Identify the determinant of supply that is affected. B. Indicate the change in supply that will occur. C. Indicate the effect on price and quantity supplied. 1. The effect of a drought in corn crop on the market for chicken wings (chickens eat corn). The effect of an increase on the diesel fuel tax on the market for truck shipping. The effect of a federal law allowing more pollution on the market for steel. The effect of an increase in the price of butter on the market for cheese (butter is not used to make cheese!). The effect of the closing of two major auto makers on the market for new cars. The effect of an increase in homebuilding on the market for books. The effect of new laws opening up drilling in the Gulf of Mexico on the market for oil. The effect of a federal law raising the minimum wage on the market for McDonald’s hamburgers. The effect of an increase in the price of Intel chips on the market for personal computers. DEMAND OR SUPPLY: YOU DECIDE Complete the items listed below for each of the following statements. A. B. C. D.
Determine if the statement is a supply or demand issue. Identify the determinant that is changing Draw a S/D graph to explain what is happening Identify price and quantity changes that will occur. The effect of a warm winter on the market for ski lift tickets. The effect of an increase in the price of wood on the market for natural gas. The effect of a deep freeze in California on the market for oranges. A decrease in the price of “jimmies” on the market for ice cream cones. Expectations of further terrorist attacks on the market for airline tickets. The effect of an increase in the price of electricity, on the market for amusement park tickets. The effect of an increase in the price of toilet paper on the market for paper towels. The effect of an increase in desire for digital movies on the internet on the market for DVD rentals. DEMAND AND SUPPLY PRACTICE PART DEUX Follow the same directions as in the first Supply and Demand combined activity that we just completed. 1. The effect of a strike that raises wages for orange pickers on the market for orange juice. 2. The effect of an increase in the price of all stadium food and beverages on the market for Steeler tickets. 3. The effect of an increase in the price of 7up on the market for Sprite. 5. The effect of an increase in community recycling programs of plastic soda pop bottles on the market for synthetic fleece clothing. 6. The effect of an increase in federal clean air standards on the market for electricity. 7. The effect of United Airlines declaring bankruptcy and going out of business on the market for airline tickets. 8. The effect of increased safety technology (airbags etc.) on the market for automobiles. 9. The effect of a surgeon-general announcement against consumption of too much red meat as being harmful to your health on the market for Chik-Fila sandwiches at the same time as a great growing season for corn in America. (2 changes needed). OIL PRICES AND SUPPLIES: A SLIPPERY SLOPE As many of us are painfully aware, especially of late, the high price of oil can really take a bite out of your pocketbook. While there are numerous forces that move the price of oil, many of them are supply driven. Since oil is an input good for making so many products, changes in the price of oil affect, to some degree or another, the prices of most goods in the economy. The following little experiment with prices should show you how changes in the price of oil on the demand side have sometimes dramatic effects on the supply side. As always, price setting in a market is a two way street! Below you will find five different oil companies with a brief description that includes the cost for each company to produce a barrel of oil. Now that you have a basic understanding of how each company operates to produce the oil that the world needs we must consider how each will respond to a change in the world price of oil. Demand forces can cause oil to drop and fall very quickly. The July-September 2008 period is one such example. Oil was $147 per bbl. in July and by the end of September it was near $97. This is a 33% drop in the price of oil in a period of just two months. While we may love this price decrease, oil companies react very differently than you or I would. Answer the questions and complete the graphical data below to better understand how the quantity of oil supplied changes (cetaris paribus) with changes in price. 1. Based on each company’s production technique and production cost, what generalization can you make about the relationship between the price of oil and the method used to get the oil? 2. Which company would be best suited to “weather a storm” of falling oil prices? Why? Which is least prepared? Why? 3. On the graph below, plot the quantity of oil produced at the different price levels indicated on the vertical axis. Make an ordered pair of the price/quantity combination for each. Remember, each company will only produce oil if the market price covers their cost of production per BBL. Use the line ABOVE the price as a marking point. Remember to add all prior quantities produced at each price point to get the market total as you increase price. Example: At $25 only 50 million barrels will be produced because only Mega Oil can afford to produce oil at such a low price. This is the point on the graph. Also, as you increase price remember that you must add each companies output that it produced at the lower prices to the total production amount. Go to each $25 increment, and place a circle at the total quantity that will be produced at that increment. 4. Based on your graph, what relationship exists between the price of oil and the quantity or oil supplied to the market? Why does the relationship happen? 5. Assume that a technological breakthrough allowed each company to cut $12 off the cost of production for each barrel of oil for each company. Draw a second curve on the graph above to show where the new supply curve would fall. HINT: Subtract $12 from each company’s production price, then go the $25 increments and put in the correct quantities represented by these new production techniques. Report "AP ECONOMICS: SUPPLY AND DEMAND WORK SCHEDULE"